Following 2015’s Garden, Lucy Grace explores a life less documented in Lucy, Lucy and Lucy Barfield, an intimate show about holding onto adventure, falling through the cracks and finding your own way back. C.S. Lewis’s dedication to his goddaughter, Lucy Barfield, in The Lion, the Witch and The Wardrobe is often acknowledged as one of the most poignant ever written yet we know nothing about the little girl it is meant for, the same little girl who gave her name to Narnia’s heroine: Lucy Pevensie. Inspired by a childhood reading fantasy novels, Lucy Grace is waiting to find the way into Narnia. It’s taking a really long time. Eventually it clicks; Narnia does not exist. She’s 26. So, Lucy returns to her favourite book to look for tips on how to survive in a world where every door leads exactly where you’d expect. If the adventures of heroine Lucy Pevensie can’t help, then perhaps C. S. Lewis’s dedication to his Goddaughter, Lucy Barfield, holds the key to another wardrobe. And so begins Lucy’s search for the lives of Lucy: past, present and fantasy. Can Lucy Barfield help Lucy Grace come to terms with a world without the possibility of Narnia? 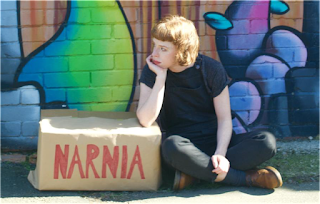 Lucy, Lucy and Lucy Barfield is an intimate piece exploring the fragility between reality and fantasy and how we sometimes have to put fairy tales away and embrace the real world head on. Lucy Grace comments, "We’ve all read articles, books, seen movies, plays about what happened to the real Alice in Wonderland or the real Peter Pan but what about the real Lucy Pevensie, Queen of Narnia? When I googled her, I only found her name mentioned on one forum run by Narnia superfans. Through reading stories online and speaking to her family what I had found out about Lucy was turned completely on its head. So, the focus of the show I was writing completely changed. Instead, I focussed on finding the real Lucy and, in doing that, I had to accept that sometimes escaping into make believe isn’t always the answer." Lucy, Lucy and Lucy Barfield explores the power of writing and how biography can sometimes manipulate other people’s lives to say what we want about the world. A musician, dancer and artist, Lucy Barfield developed multiple sclerosis at the age of 29 and began a very rapid decline into ill health which led to her living in various hospitals, most notably The Royal Hospital for Neuro-disability in Putney where she spent the last 13 years of her life. Despite almost total paralysis Lucy managed at points to create artwork and write poetry which she communicated to friends through blinking. Lucy Barfield died after a bout of pneumonia on 3rd May 2003.